In four experiments, the association between arousal state and different mind-wandering states was examined. Participants performed a sustained attention task while pupil responses were continuously recorded. Periodically during the task, participants were presented with thought probes to determine if they were on task or mind wandering. Across the four experiments, the results suggested that in situations that promoted on-task behaviors and focused external attention, mind wandering was associated with lowered arousal, as seen by smaller tonic pupil diameters and smaller phasic pupillary responses. However, in situations that promoted a more internal focus of attention, there were no differences between on-task states and mind wandering in tonic pupil diameter (although differences emerged for phasic pupillary responses), suggesting similar arousal levels. Furthermore, across the four experiments, mind blanking and mind wandering dissociated in terms of whether the situation promoted focused external attention or focused internal attention. These results are broadly consistent with the notion that mind wandering is a heterogeneous construct, with different forms of mind wandering being associated with different arousal states, and suggest that a combination of behavioral and pupillary measures can be used to track these various states. Lapses of attention occur when an individual briefly disengages from the current task. These everyday occurrences can lead to relatively minor inconveniences (such as leaving your coffee cup on top of your car) or to more dramatic consequences (such as failing to put the landing gear down prior to landing an airplane; Reason, 1990). Understanding the nature of different types of lapses of attention is important not only for understanding the attention system more broadly but also for understanding when and for whom fluctuations in attention are most likely. A common type of disengagement of attention away from a focal task is mind wandering. Mind wandering refers to drifts of attention from the current train of thought (often an external task) to internal thoughts (Smallwood & Schooler, 2015). There are a number of different dimensions of mind wandering, including temporal focus, emotional valence, self-relevance, and intentionality, among others (Andrews-Hanna et al., 2013; Grodsky & Giambra, 1990–1991; Klinger, 1999, 2009; Seli, Risko, & Smilek, 2016). Prior research suggests that 25% to 50% of our waking life is devoted to mind wandering (Kane et al., 2007; Killingsworth & Gilbert, 2010). Furthermore, mind wandering has been shown to correlate with ADHD symptomology (Franklin et al., 2014; Seli, Smallwood, Cheyne, & Smilek, 2015), variation in attention control (Kane et al., 2016; McVay & Kane, 2012; Unsworth & McMillan, 2014), working memory capacity (McVay & Kane, 2012; Mrazek et al., 2012; Unsworth & McMillan, 2014; Unsworth & Robison, 2016b), intelligence (Mrazek et al., 2012; Unsworth & McMillan, 2014), motivation levels (Seli et al., 2015, b; Unsworth & McMillan, 2013), and aspects of personality (Robison, Gath, & Unsworth, 2017), among others. Although there may be some benefits to mind wandering (e.g., planning, problem solving an unrelated task), for the most part, mind wandering can be seen as an unwanted breakdown of our attentional system when we are supposed to be focused on the primary external task. A number of techniques have been developed to examine mind wandering, including thought-probe techniques in which periodically throughout a task participants are probed as to their current attentional state (on task vs. mind wandering), and this is examined as a function of various experimental manipulations (see Smallwood & Schooler, 2006, 2015, for reviews). This research has found that mind-wandering rates vary as a function of task variables such as time on task, task complexity, and task difficulty (Antrobus, Singer, & Greenberg, 1966; McVay & Kane, 2010; Smallwood & Schooler, 2006; Thomson, Seli, Besner, & Smilek, 2014; Unsworth & Robison, 2016a). Importantly, mind-wandering rates are associated with task performance such that performance is lower when participants report mind wandering on the preceding trial compared with when participants report that they are currently focused on the task (McVay & Kane, 2010; Smallwood & Schooler, 2006; Stawarczyk, Majerus, Maj, Van der Linden, & D’Argembeau, 2011; Thomson et al., 2014; Unsworth & Robison, 2016a). Thus, mind wandering is a frequent occurrence, even during attention-demanding tasks, and fluctuations of attention due to mind wandering are associated with poorer performance on an external task. A great deal of research suggests that the locus coeruleus norepinephrine system (LC-NE) is particularly important for sustained attention and alertness (Aston-Jones & Cohen, 2005; Berridge & Waterhouse, 2003; Chamberlain & Robbins, 2013; Samuels & Szabadi, 2008; Szabadi, 2013). The LC is a brainstem neuromodulatory nucleus that is responsible for most of the NE released in the brain, and it has widespread projections throughout the neocortex, including frontoparietal areas (Berridge & Waterhouse, 2003; Samuels & Szabadi, 2008; Szabadi, 2013). The LC also receives major inputs from the frontal cortex (particularly the anterior cingulate cortex), suggesting a reciprocal connection between the LC-NE system and the frontal cortex (Arnsten & Goldman-Rakic, 1984; Jodo, Chiang, & Aston-Jones, 1998; Rajkowski, Lu, Zhu, Cohen, & Aston-Jones, 2000). Generally, the LC-NE system has been associated with general functions such as the sleep–wake cycle and overall arousal levels (Berridge & Waterhouse, 2003; Samuels & Szabadi, 2008; Szabadi, 2013). In particular, the LC-NE system is important for determining arousal state and attentional interest. Within the LC-NE system, neurons demonstrate two modes of firing: tonic and phasic. Tonic activity refers to the overall baseline activity, and phasic activity refers to the brief increase in firing rate associated with salient stimuli. A great deal of recent research suggests that there is an inverted-U relationship between LC tonic activity and performance on various cognitive tasks, consistent with the Yerkes–Dodson curve (Yerkes & Dodson, 1908). When tonic LC activity is low (hypoarousal), individuals are inattentive, nonalert, and disengaged from the current task, leading to poor behavioral performance and little to no phasic LC activity in response to task-relevant stimuli. As tonic LC activity increases to an intermediate range, attention becomes more focused, LC phasic activity increases for target stimuli, and behavioral performance is optimal. If tonic LC activity increases further, the individual experiences a more distractible attentional state (hyperarousal and stress), leading to task disengagement, lowered LC phasic activity, and a reduction in behavioral performance. Research relying on intracranial recordings and psychopharmacological manipulations has provided evidence in support of the notion of an inverted-U relationship between the LC-NE system and behavioral performance (Aston-Jones & Cohen, 2005; Berridge & Waterhouse, 2003; Chamberlain & Robbins, 2013; Ramos & Arnsten, 2007). In short, too much or too little tonic activity leads to little phasic firing and poor attention control, whereas optimal levels of arousal and attention are achieved via intermediate tonic activity and maximal phasic activity. Thus, the LC-NE is critically important for regulating attentional state via synergistic tonic and phasic activity. Lenartowicz, Simpson, and Cohen (2013) suggested that the LC-NE system is associated with a variety of different types of lapses of attention. Specifically, Lenartowicz et al. (2013) suggested that both input orientation (internal vs. external) and arousal state are important for determining where attention is directed, as well as current attention levels. When attention is directed externally and arousal is at intermediate levels, attention is focused on the current external task. However, if attention is directed externally and arousal levels are too high or low, lapses of attention can occur due to attentional capture from salient external distractions. When attention is directed internally and arousal is at intermediate levels, attention is focused internally (such as during problem solving or autobiographical retrieval). However, when attention is directed internally and arousal levels are low, mind wandering and mind blanking occur. When attention is directed internally and arousal levels are high, more exploratory mind wandering, ruminations, or racing thoughts can occur. Thus, Lenartowicz et al. (2013) suggest that the type of lapse of attention is determined by arousal levels from the LC-NE system and by whether attention is directed to external stimuli or to internal thoughts. Similarly, Mittner, Hawkins, Boekel, and Forstmann (2016) have suggested that there are three different states associated with LC-NE functioning. Specifically, when LC tonic activity is optimal and attention is directed externally, participants are in an on-task state. When LC tonic activity is too high, participants are in an off-focus exploratory state and disengaged from the current task. However, when LC tonic activity is optimal and attention is directed internally (potentially to current concerns), active mind wandering occurs. Thus, like Lenartowicz et al. (2013), Mittner et al. (2016) suggest that mind wandering is linked to LC tonic activity and arousal levels and further suggest that active mind wandering is associated with an internal focus of attention linked with intermediate LC tonic activity and arousal levels. One means of tracking changes in arousal state is pupillometry. Prior research has shown that the pupil dilates in response to the cognitive demands of a task (Beatty, 1982). These effects reflect task-evoked pupillary responses (TEPRs), in which the pupil dilates relative to baseline levels due to increases in cognitive processing load. A number of studies have demonstrated similar TEPRs in a variety of tasks (see Beatty & Lucero-Wagoner, 2000, for a review). These and other results led Kahneman (1973) and Beatty (1982) to suggest that TEPRs are a reliable and valid psychophysiological marker of cognitive effort and the intensity of attention. Recent research has also suggested that pupil dilations are indirectly related to the functioning of the LC-NE system (Alnæs et al., 2014; Aston-Jones & Cohen, 2005; Eldar, Cohen, & Niv, 2013; Gilzenrat, Nieuwenhuis, Jepma, & Cohen, 2010; Jepma & Nieuwenhuis, 2011; Joshi, Li, Kalwani, & Gold, 2016; McGinley, David, & McCormick, 2015; Murphy, O’Connell, O’Sullivan, Robertson, & Balsters, 2014; Murphy, Robertson, Balsters, & O’Connell, 2011; Reimer et al., 2016; Samuels & Szabadi, 2008; Unsworth & Robison, 2016a; van den Brink, Murphy, & Nieuwenhuis, 2016; Varazzani, San-Galli, Dilardeau, & Bouret, 2015). Specifically, when LC tonic levels are low and arousal is low, baseline pupil diameter is small and so are TEPRs. When individuals are hyperaroused and tonic LC levels are very high, overall baseline pupil diameter is relatively large and TEPRs are small. However, when LC tonic levels are optimal and arousal is at intermediate levels, overall baseline pupil diameter is at intermediate levels and TEPRs are at their largest. Although prior work is suggestive of a link between LC-NE functioning and pupil diameter, it should be acknowledged that this relation is correlational in nature, and it could be because both the LC and the sympathetic nervous system are linked via a third system such as the nucleus paragigantocellularis (Nieuwenhuis, de Geus, & Aston-Jones, 2011). Collectively, this work suggests that baseline pupil diameter and TEPRs should provide an indirect index of LC-NE functioning. In terms of mind wandering, several recent studies have examined links between pupil dilations and reports of mind wandering during cognitive tasks. Specifically, Franklin, Broadway, Mrazek, Smallwood, and Schooler (2013) had participants read a story and periodically presented thought probes asking if participants were on or off task. Franklin et al. found that off-task reports were associated with larger pupil dilations than were on-task reports. Conversely, both Grandchamp, Braboszcz, and Delorme (2014) and Mittner et al. (2014) found that off-task reports were associated with smaller baseline pupil diameters than were on-task reports (see also Konishi, Brown, Battaglini, & Smallwood, 2017). More recently, Unsworth and Robison (2016a) had participants perform a sustained attention task (the psychomotor vigilance task), and participants were periodically presented with thought probes during the task. Importantly, rather than simply asking if participants were on or off task, participants were asked if they were on task, thinking about their performance on the task (task-related interference), were distracted by external stimuli, were mind wandering, or were nonalert and mind blanking. The results suggested that mind wandering and mind blanking/nonalertness were associated with smaller tonic (baseline) pupil diameters and smaller TEPRs than were on-task reports. These results, combined with similar results from Grandchamp et al. (2014) and Mittner et al. (2014), suggest that much of the time when participants report mind wandering during attention-demanding tasks, mind wandering is associated with low arousal levels (and potentially low LC tonic activity). The aim of the current study was to examine whether arousal state is associated with different mind-wandering states using pupillometry. As shown in Fig. 1, and consistent with prior theorizing by Lenartowicz et al. (2013) and Mittner et al. (2016), we hypothesized that there may be three distinct mind-wandering states associated with different levels of arousal and the extent to which the current situation promotes an external or internal orientation of attention. Specifically, mind wandering can be associated with low arousal levels (consistent with nonalertness), optimal arousal levels (consistent with active mind wandering), or high arousal levels (consistent with exploratory mind wandering). In each case, attention should be focused on the external task, but attention sometimes drifts to internal thoughts and concerns based on the current situation. In situations that promote an external focus of attention, drifts to internal thoughts likely occur due to either low arousal (nonalert mind wandering) or high arousal (exploratory mind wandering). In situations that promote an internal focus of attention (such as a pressing personal concern or a task that allows for task-contingent time-outs), more active mind wandering is likely to occur in which arousal is at optimal levels and attention is focused internally rather than to the external task. To examine these different mind-wandering states, we will rely on a triangulation approach (Konishi & Smallwood, 2016), in which subjective reports of mind wandering, behavioral performance, and pupil dilations (tonic and TEPR) will be examined together. Shown in Table 1 are the predictions associated with on-task reports and different mind-wandering states. Specifically, on-task reports should be associated with intermediate arousal, in which tonic pupil diameter is at intermediate levels, TEPRs are large and strong, and performance is optimal, indicating that attention is focused on the current external task. Nonalert mind wandering should be associated with low arousal, in which tonic pupil diameter is small, TEPRs are small and weak, and task performance is poor, indicating that although attention should be directed to the external task, momentary lapses of attention occur, in which attention drifts to internal thoughts, and task focus is reduced. Active mind wandering should be associated with optimal arousal, in which tonic pupil diameter is at intermediate levels (and not different from on-task levels), TEPRs are small and weak, and task performance is poor. In this state, active mind-wandering and on-task states should be very similar in terms of arousal, but whereas on-task states are associated with attention being focused on the current task, active mind-wandering states are associated with attention being focused internally, leading to lowered TEPRs and worse behavioral performance (i.e., less on-task focus). Finally, exploratory mind-wandering should be associated with high arousal, in which tonic pupil diameter is large, TEPRs are small and weak, and task performance is poor, indicating attention is not focused on the current external task. In each case of mind wandering, behavioral performance should be poor, and TEPRs should be small (indicative of perceptual decoupling), but tonic pupil size should vary as a function of arousal. Here, we report the results of four experiments conducted to better test the hypothesis that there are different types of mind wandering associated with different arousal states. Several prior studies have found that during demanding attention control tasks, mind-wandering reports are associated with smaller tonic pupil diameter than are on-task reports, consistent with nonalert mind wandering (Grandchamp et al., 2014; Mittner et al., 2014; Unsworth & Robison, 2016a). The purpose of Experiment 1 was to replicate and extend these findings in a larger sample of participants across two different attention control tasks. A large number of participants performed both the psychomotor vigilance task and the Stroop task while their pupils’ were continuously measured. Periodically during both tasks, participants were presented with thought probes asking about their current mental state and focus. Participants were 165 individuals between the ages of 18 and 35 years, recruited from the subject pool at the University of Oregon. Of these participants, 152 had complete psychomotor vigilance data and 157 had complete Stroop data. Each participant was tested individually in a laboratory session lasting approximately 2 hours. After signing informed consent, all participants completed operation span, symmetry span, reading span, psychomotor vigilance task, antisaccade, Stroop, Ravens Advanced Progressive Matrices, letter sets, syllogisms, and a visual-working-memory filtering task. All tasks were administered in the order listed above. The data are from a larger project (Unsworth & Robison, 2017) examining individual differences. Here, we only focus on the psychomotor vigilance and Stroop tasks. Please characterize your current conscious experience. During the introduction to the task, participants were given specific instructions regarding the different categories. Response 1 was considered on task. Response 2 measures task-related interference and was not included in the analyses. Response 3 was considered external distraction, Response 4 was considered mind wandering, and Response 5 was considered mind blanking/inattention (see also Unsworth & Robison, 2016a). In Unsworth and Robison (2017), we combined Responses 3–5 into a single off-task score and did not specifically examine separate mind-wandering reports. Prior to each trial, there was a 2-s baseline period with “+++++” in the center of the screen to determine baseline pupil diameter. Following this, participants were presented with a row of zeros in the center of the screen, and after a variable wait time (equally distributed from 2 to 10 s in 500-ms increments), the zeros began to count up in 17-ms intervals from zero ms. The participants’ task was to press the space bar as quickly as possible once the numbers started counting up. After pressing the space bar, the reaction time (RT) was left on-screen for 1 s to provide feedback to the participants. Following feedback, a 500-ms blank screen was presented, and then either the next trial started or participants were presented with a thought probe. The entire task lasted for 10 min for each individual (about 75 total trials). Fifteen thought probes were randomly presented after trials. Prior to each trial, there was a 2-s baseline period with “+++++” in the center of the screen to determine baseline pupil diameter. Following this, participants were shown a color word (red, green, or blue), presented in one of three different font colors (red, green, or blue). The participants’ task was to indicate the font color via key press (red = 1, green = 2, blue = 3). Participants were told to press the corresponding key as quickly and accurately as possible. Participants received 15 trials of response mapping practice and six trials of practice with the real task. Participants then received 100 real trials. Of these trials, 67% were congruent such that the word and the font color matched (i.e., red printed in red), and the other 33% were incongruent (i.e., red printed in green). Twelve thought probes were randomly presented after incongruent trials. For the psychomotor vigilance and Stroop tasks, participants were tested individually in a dimly lit room. Pupil diameter was continuously recorded binocularly at 120 Hz using a Tobii T120 eye tracker, integrated in a 17-inch TFT monitor. Data from each participant’s left eye were used. Participants were seated approximately 60 cm from the monitor. Missing data points due to blinks, off-screen fixations, and/or eye-tracker malfunction were removed.1 We did not exclude whole trials for missing data. Pretrial baseline responses were computed as the average pupil diameter during the fixation screen (2,000 ms) for each task. Pretrial baselines were z-scored normalized within each participant to correct for individual differences in pupil diameter. TEPRs were corrected by subtracting out the last 200 ms of the wait time and locked to when the numbers began counting up on a trial-by-trial basis for each participant. To examine the time course of the TEPRs, the pupil data were averaged into a series of 20-ms time windows following stimulus onset for each trial. The dependent measure in the TEPR analyses was the peak task-evoked response. Specifically, the peak was defined as the maximal dilation following stimulus onset for each trial and each participant. The peak dilation typically occurred between 550 ms and 750 ms poststimulus in the psychomotor vigilance task (Unsworth & Robison, 2016a). The last 200 ms of the wait time was then subtracted from the peak dilation for each trial and each participant to get the peak task-evoked response for that trial (Beatty & Lucero-Wagoner, 2000). These values were then averaged within each participant and used as the dependent measure in the TEPR analyses. Examining on-task versus mind-wandering reports suggested that participants reported being on task more than mind wandering in both the psychomotor vigilance (M on task = .35, SD = .28 vs. M mind wandering = .16, SD = .16), t(151) = 6.16, p < .001, d = .49, and Stroop tasks (M on task = .44, SD = .34 vs. M mind wandering = .13, SD = .16), t(156) = 8.96, p < .001, d = .74. Furthermore, on-task reports were associated with faster reaction times than were mind-wandering reports for both the psychomotor vigilance task (M on task = 323 ms, SD = 39 vs. M mind wandering = 395 ms, SD = 89), t(97) = −7.71, p < .001, d = −.86, and the Stroop task (M on task = 783 ms, SD = 237 vs. M mind wandering = 889 ms, SD = 238), t(66) = −3.12, p = .003, d = -.38.2 Note that comparisons between on task and mind wandering only include those participants who reported being both on task and mind wandering during each task. For example in the psychomotor vigilance task 98, out of 152 participants had both on-task and mind-wandering reports. Excluded participants typically reported a combination of experiencing task-related interference, being distracted or mind blanking (see below). Next, we turn to our primary analyses of interest—examining pupil size. As noted previously, pupil diameter was measured continuously throughout both tasks. Therefore, both tonic pretrial baseline and TEPRs were examined. First, we examined differences in tonic pupil diameter (pretrial baselines) for on-task and mind-wandering reports for each task. As shown in Fig. 2, pretrial baseline pupil diameter was larger for on-task reports than for mind-wandering reports in both the psychomotor vigilance, t(91) = 2.81, p = .006, d = .30, and Stroop tasks, t(59) = 2.39, p = .020, d = .32. Examining TEPRs similarly suggested that on-task reports were associated with larger TEPRs than were mind-wandering reports in both the psychomotor vigilance, t(77) = 2.10, p = .039, d = .28, and Stroop tasks, t(44) = 2.17, p = .035, d = .33. Note that the pupil waveforms are used mainly for visualization, while the dependent measure in the analysis is the peak task-evoked response. Overall, the current results replicate and extend prior research suggesting that during demanding attention control tasks, reports of mind wandering are associated with worse behavioral performance, smaller tonic pupil diameters, and smaller TEPRs compared with on-task reports (Grandchamp et al., 2014; Mittner et al., 2014; Unsworth & Robison, 2016a). As such, these results suggest that much of the time when participants report mind wandering during attention control tasks, this form of mind wandering is associated with a low arousal state and lowered alertness. The purpose of Experiment 2 was to try to increase tonic arousal during mind wandering and have attention focused more internally. That is, we hoped to get participants to engage in more active mind wandering during a sustained attention task. To do so, we had participants perform a longer version of the psychomotor vigilance task from Experiment 1. Prior to performing the task, participants were told that, following the task, they would have to give a 5-min speech about their dream job in front of a video camera (based on the Trier Social Stress Test; Kirschbaum, Pirke, & Helhammer, 1993). This manipulation has been shown to increase stress and arousal, and thus we expected to increase arousal and get participants to actively mind wander in the form of planning during the sustained attention task. Similar stress manipulations have been shown to increase reports of mind wandering related to anxiety and worry (Antrobus et al., 1966; Horowitz, 1975). If the manipulation increases arousal and participants engage in more active mind wandering, we should see that reports of mind wandering increase, and tonic pupil size will be the same (or even greater) for mind-wandering reports compared with on-task reports. However, mind-wandering should still be associated with poorer behavioral performance and smaller TEPRs (due to perceptual decoupling) compared with on-task reports. Note that in this experiment and in the subsequent experiments, we increased the number of trials on the psychomotor vigilance task and the number of thought probes to increase the number of usable trials available for analysis. Participants were 30 individuals between the ages of 18 and 35 years, recruited from the subject pool at the University of Oregon. Each participant was tested individually in a laboratory session lasting approximately 1 hour. Data from two participants were excluded from analyses because of excessive (i.e., more than 50%) missing eye data, leaving a final sample of 28 participants. Following this task, you will be asked to come up with a brief speech. Specifically, you will be given 5 minutes to come up with a speech for a job interview. Two trained interviewers will soon assess how outgoing, gregarious, and comfortable you are in situations in which you must project yourself as an expert. This is a type of personality test for a trait called extraversion. You will be given a hypothetical situation in which you will be applying for your ideal job. In this hypothetical situation, you have dreamed about working in this job for as many years as you can remember. You have just seen an advertisement for this perfect job and have decided to apply. After submitting your application, you have been invited for an interview. The job pays a very large salary. You are competing against a lot of other candidates, and the final selection will be made based on your ability to convince the interviewers of how your experiences, abilities, and education make you a better candidate than the others. The purpose of your speech is to try to convince the panel of interviewers that you are the best candidate for the position. After the numbers task, you will be given 5 minutes to come up with the speech, and then will have to give the speech in front of a video camera so that the panel can judge it. Thought probes were the same as in Experiment 1. Eye tracking was the same as in Experiment 1. Examining on-task versus mind-wandering reports suggested similar rates of on task and mind wandering (M on task = .19, SD = .20 vs. M mind wandering = .24, SD = .18), t(27) = −.85, p = .403, d = −.17. Furthermore, on-task reports were associated with faster reaction times than were mind-wandering reports (M on task = 322 ms, SD = 50 vs. M mind wandering = 444 ms, SD = 118), t(22) = −5.48, p < .001, d = −1.36. First, examining differences in tonic pupil diameter for on-task and mind-wandering reports suggested that pretrial baseline pupil diameter was similar for on-task and mind-wandering reports, t(22) = .45, p = .656, d = .09 (see Fig. 3a). However, examining TEPRs suggested that on-task reports were associated with larger TEPRs than were mind-wandering reports, t(17) = 2.45, p = .026, d = .59 (see Fig. 3b). Consistent with Experiment 1, the results from Experiment 2 suggested that mind-wandering reports were associated with poorer task performance and smaller TEPRs than were on-task reports. Importantly, however, there was no difference between mind-wandering and on-task thought reports in terms of tonic pupil size. These results suggest that the stress manipulation increased arousal levels, and participants likely engaged in mind wandering associated with increased arousal rather than mind wandering associated with nonalertness and low arousal levels as in Experiment 1. As such, the results from Experiment 2 further reinforce the idea that different mind-wandering states are associated with different arousal levels. Although it should be noted that this conclusion would be considerably stronger had we included a control condition in which participants performed the psychomotor vigilance task without the stress manipulation in order to test the suggested interaction. In the next experiments and in the combined cross-experimental analyses, the interactions are directly tested. Furthermore, additional stress manipulations are needed to fully examine the multitude of ways stress can influence mind-wandering and arousal levels. Overall, the Experiment 2 results are consistent with the notion that when participants engage in potentially more active mind wandering (such as planning), their arousal levels are similar to those for on-task states, differing primarily in that in the active mind-wandering state attention is focused internally, whereas in the on-task state attention is focused on the external task. The main goal of Experiment 3 was to try and get participants to disengage from the sustained attention task and actively mind wander via changes in expectancy during the task. A key aspect of sustained attention tasks is the uncertainty of when the signal will occur. For example, in the current psychomotor vigilance task, the numbers begin counting up anywhere from 2 s to 10 s after they appear. Thus, participants must maintain focused attention on the stimulus and maintain a high level of preparation in order to rapidly press the space bar once the numbers begin counting. This preparatory maintenance process is thought to be effortful (Jennings & van der Molen, 2005; Woodrow, 1914). A fixed temporal structure in which the stimulus always occurs at the same time, however, requires less focused attention and typically results in better overall performance on sustained attention tasks (Langner & Eickhoff, 2013; Shaw, Finomore, Warm, & Matthews, 2012). Rather than needing to maintain attention throughout the entire interval, participants can ramp up attention and preparation in line with the occurrence of the stimulus (based on their time-estimation abilities). As noted by Shaw et al. (2012), this should allow participants to take “task-contingent” time-outs. If this is the case, then participants performing the psychomotor vigilance task with a fixed temporal structure (i.e., numbers always counting up after 5 s) should be able to engage in more active mind wandering than would participants in the standard psychomotor vigilance task with variable wait times that requires more continuous focused attention. That is, if we make the task less attention demanding, we should be able to move people into a more internal state of focus, consistent with active mind wandering. If participants engage in more active mind wandering in the fixed condition, we should see that tonic pupil size will be the same for mind-wandering reports and on-task reports. The variable condition, however, should replicate prior research (Unsworth & Robison, 2016a, Experiment 1), demonstrating smaller tonic pupil size for mind-wandering compared with on-task reports. Furthermore, in both conditions mind wandering should still be associated with poorer behavioral performance and smaller TEPRs (due to perceptual decoupling) compared with on-task reports. A second goal of Experiment 3 was to examine whether the temporal focus of mind wandering (past, present, future) is related to differences in tonic pupil size (e.g., Konishi et al., 2017), and whether this changes as a function of the temporal structure of the task. For example, future planning might be associated with active mind wandering or even a more exploratory mode of mind wandering compared with mind wandering associated with past or current thoughts. Furthermore, the temporal focus of mind wandering might change as a function of task demands, such that in the less demanding task participants can engage in more active future planning than in the more demanding task. To examine these issues, participants performed either the same psychomotor vigilance task as in Experiment 2 with variable wait times, or performed a version of the psychomotor vigilance task in which the numbers always began counting up after 5 s. Thought probes were randomly presented during the task and included assessments of the temporal focus of mind wandering. Participants were 71 individuals between the ages of 18 and 35 years, recruited from the subject pool at the University of Oregon. Each participant was tested individually in a laboratory session lasting approximately 1 hour. Participants were randomly assigned to either the variable condition (N = 35) or to the fixed condition (N = 36). Participants performed the same psychomotor vigilance task as in Experiment 2 ,with 160 trials lasting approximately 30 min. Prior to each trial, there was a 2-s baseline period with “+++++” in the center of the screen to determine baseline pupil diameter. Following this, participants were then presented with a row of zeros in the center of the screen. In the variable condition, after a variable wait time (equally distributed from 2 to 10 s in in 500-ms increments) the zeros began to count up in 17-ms intervals from zero ms. In the fixed condition, the zeros always began counting up after 5 s. The participants’ task was to press the space bar as quickly as possible once the numbers started counting up. After pressing the space bar, the RT was left on-screen for 1 s to provide feedback to the participants. Following feedback, a 500-ms blank screen was presented, and then either the next trial started or participants were presented with a thought probe. Thirty thought probes were randomly presented after roughly 19% of the trials. During the introduction to the task, participants were given specific instructions regarding the different categories. Response 1 was considered on task. Response 2 measures task-related interference and was not included in the analyses. Response 3 was considered external distraction, Response 4 was considered past-oriented mind wandering, Response 5 was considered future-oriented mind wandering, Response 6 was considered present-oriented mind wandering, and Response 7 was considered mind blanking/inattention. Examining on-task versus mind-wandering reports (past, future, and current combined) suggested similar rates of on task and mind wandering (M on task = .20, SD = .20 vs. M mind wandering = .24, SD = .19), F(1, 69) = 1.15, MSE = .050, p = .288, ηp2 = .016, and this did not change as a function of condition, F(1, 69) = .36, MSE = .050, p = .552, ηp2 = .005. Next, we examined differences in the temporal focus of the mind-wandering reports as a proportion of the total number of thought probes (i.e., dividing the total number of each type of mind-wandering report by the total number of probes) and condition. There was a main effect of temporal focus, F(2, 138) = 4.33, MSE = .011, p = .015, ηp2 = .059, in which past-oriented mind wandering occurred less frequently (M = .05, SD = .08), than did future-oriented mind wandering (M = .10, SD = .14), t(70) = −2.85, p = .006, d = −.34, or present-oriented mind wandering (M = .08, SD = .10), t(70) = −2.15, p = .035, d = −.25. There was no difference between future-oriented and present-oriented mind wandering, t(70) = 1.08, p = .284, d = .12. There was no main effect of condition, F(1, 69) = .005, MSE = .001, p = .942, ηp2 = .000, nor an interaction between the two factors, F(2, 138) = 2.00, MSE = .011, p = .139, ηp2 = .028. Examining overall reaction times suggested that responses were faster in the fixed condition (M = 331 ms, SD = 45) than in the variable condition (M = 365 ms, SD = 38), t(69) = 3.42, p = .001, d = .82. As shown in Fig. 4, on-task reports were associated with faster reaction times than were overall mind-wandering reports, F(1, 48) = 22.68, MSE = 4533.07, p < .001, ηp2 = .32, and this did not change as a function of condition, F(1, 48) = .000, MSE = 4533.07, p = .999, ηp2 = .000. Next, we attempted to examine differences between the different mind-wandering reports, but, as noted previously, there were very few reports of past-oriented mind wandering, and very few participants reported all three types of mind wandering. Specifically, 46.5% of participants did not report any past-oriented mind wandering, 22.5% of participants did not report any future-oriented mind wandering, and 29.6% did not report any present-oriented mind wandering. Furthermore, only 38% of participants reported all three types of mind wandering. Thus, there were not enough participants to properly analyze the data. Examining differences in tonic pupil diameter for on-task and mind-wandering reports as a function of condition suggested no effect of attentional state, F(1, 45) = 1.68, MSE = .18, p = .20, ηp2 = .04, no effect of condition, F(1, 45) = .55, MSE = .20, p = .46, ηp2 = .01, and no interaction between the two factors, F(1, 45) = 1.48, MSE = .18, p = .23, ηp2 = .03. Although the interaction was not significant, we went ahead with our planned comparisons to examine whether differences in tonic pupil diameter would emerge in the variable condition (replicating prior work), but not in the fixed condition. As shown in Fig. 5a, on-task reports were associated with larger pretrial pupil diameter than with mind wandering in the variable condition, t(21) = −2.19, p = .040, d = .48, but on-task and mind-wandering reports were associated with similar pretrial pupil diameters in the fixed condition, t(24) = .05, p = .960, d = .01. Examining TEPRs as a function of attentional state and condition suggested that on-task reports were associated with larger TEPRs than were mind-wandering reports, F(1, 41) = 8.87, MSE = .004, p = .005, ηp2 = .18 (see Figs. 5b–c). There was no effect of condition, F(1, 41) = .85, MSE = .008, p = .36, ηp2 = .02, and no interaction between the two factors, F(1, 41) = 1.39, MSE = .004, p = .25, ηp2 = .03. Similar to the reaction-time results, there were not enough participants to examine differences between the different mind-wandering reports for pupil diameter. The results from Experiment 3 suggested that, consistent with the prior experiments, mind-wandering reports were associated with poorer task performance and smaller TEPRs than were on-task reports. These results suggest that during mind-wandering episodes, perceptual decoupling occurs where the participant’s attention is focused internally rather than on the external task. Examining tonic pupil diameter suggested ambiguous results. 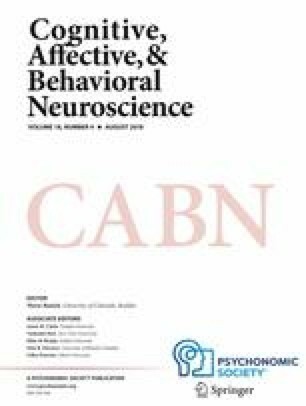 In particular, the overall interaction between attention state and condition was not significant. However, the planned comparisons suggested that in the variable condition, on-task reports were associated with larger tonic pupil diameters than were mind-wandering reports. This is consistent with prior results suggesting that in this condition, mind wandering was associated with lower arousal levels than when on task. In the fixed condition, there were no differences between on-task and mind-wandering reports (similar to Experiment 2), suggesting that in this condition, arousal levels were similar for on task and mind wandering. These results could be due to a general decrease in arousal levels resulting in similar arousal levels for both on-task and mind-wandering states. Additionally, similar arousal levels for on task and mind wandering could be due to participants allocating less attention to the task (taking time-outs) and engaging in more active mind wandering. Although the interpretation is consistent with the overall theoretical framework, the lack of a significant interaction makes the current results inconclusive. Given the inconclusive results from Experiment 3, Experiment 4 was conducted to further examine whether a fixed temporal structure results in different types of mind wandering. In particular, we were interested in examining how task pacing would influence overall mind wandering and potentially different mind-wandering states associated with different arousal levels. Prior research has suggested that task pacing has a strong influence on mind-wandering rates (Antrobus, 1968; Giambra, 1995; Grodsky & Giambra, 1990–1991). In particular, it is thought that fast-paced tasks should promote on-task behaviors, whereas slow-paced tasks should promote mind wandering and task disengagement. This notion is consistent with prior research on goal neglect, which suggests that task pacing influences goal-maintenance abilities (De Jong, Berendsen, & Cools, 1999). For example, De Jong et al. (1999) reasoned that a fast-paced task should keep attention tightly focused on the task goal, thereby preventing goal neglect. Slow-paced tasks, however, should induce more goal neglect, as participants would have ample time to think about things unrelated to the task (i.e., mind wander) at hand, and thus the goal would not be as actively maintained. This suggests that in a fast-paced task, attention should be tightly focused on the task goal, resulting in better performance and less mind wandering. In terms of pupil diameter, we expect that the infrequent mind wandering that occurs in this situation should be due to nonalert mind wandering (and not active mind wandering) associated with smaller tonic pupil diameter and lowered arousal levels. In the slow-paced task, like the fixed interval in Experiment 3, participants should be able to take time-outs and actively mind wander. This should result in slower performance and more mind wandering compared with the fast-paced task. In terms of pupil diameter, we expect that mind wandering in this situation should be associated with similar tonic pupil diameter as in on-task reports, indicating similar overall arousal levels. An additional goal of Experiment 4 was to examine whether intentionality of mind wandering is related to differences in tonic pupil size and whether this changes as a function of task pacing. Prior research has suggested that an important aspect of mind wandering is whether it is spontaneous and unintentional or deliberate and intentional (Grodsky & Giambra, 1990–1991; Seli et al., 2015, b; Seli et al., 2016, b; Seli et al., 2016, b). For example, Seli et al. (2016, b) recently found that intentional mind wandering increased in an easy sustained attention task compared with a hard sustained attention task. Thus, the nature of the task can induce participants to engage in different types of mind wandering. If participants are intentionally engaging in active mind wandering, then this type of mind wandering should be associated with intermediate arousal levels in which tonic pupil diameter is the same for on-task and mind-wandering reports. Spontaneous unintentional mind wandering, however, should be more associated with lowered arousal levels in which tonic pupil diameter is smaller for mind-wandering reports than for on-task reports. To examine these issues, participants performed the psychomotor vigilance task in which the numbers always began counting up after 2 s (Fixed 2) or after 8 s (Fixed 8). Thought probes were randomly presented during the task and included assessments of intentionality of mind wandering. Participants were 81 individuals between the ages of 18 and 35 years, recruited from the subject pool at the University of Oregon. Each participant was tested individually in a laboratory session lasting approximately 1 hour. Participants were randomly assigned to either the Fixed 2 condition (N = 39) or the Fixed 8 condition (N = 42). Participants performed the same psychomotor vigilance task as in Experiment 3, with 120 trials lasting approximately 30 min. Prior to each trial, there was a 2-s baseline period, with “+++++” in the center of the screen to determine baseline pupil diameter. Following this, participants were presented with a row of zeros in the center of the screen. In the Fixed 2 condition, the zeros always began counting up after 2 s. In the Fixed 8 condition, the zeros always began counting up after 8 s. The participants’ task was to press the space bar as quickly as possible once the numbers started counting up. After pressing the space bar, the RT was left on-screen for 1 s to provide feedback to the participants. Following feedback, a 500-ms blank screen was presented, and then either the next trial started or participants were presented with a thought probe. Twenty-three thought probes were randomly presented after roughly 19% of the trials. During the introduction to the task, participants were given specific instructions regarding the different categories. Response 1 was considered on task. Response 2 measures task-related interference and was not included in the analyses. Response 3 was considered external distraction, Response 4 was considered intentional mind wandering, Response 5 was considered unintentional mind wandering, and Response 6 was considered mind blanking/inattention. Examining on-task versus mind-wandering reports (intentional and unintentional combined) suggested that participants reported being on task more than mind wandering (M on task = .29, SD = .27 vs. M mind wandering = .17, SD = .16), F(1, 79) = 10.13, MSE = .063, p = .002, ηp2 = .11. Importantly, this interacted with task pacing, F(1, 79) = 7.64, MSE = .063, p = .007, ηp2 = .09. As shown in Fig. 6a, the fast-paced task on-task reports were more common than were the mind-wandering reports, t(38) = 4.13, p < .001, d = .67. However, in the slow-paced task, on-task and mind-wandering reports were similar, t(41) = .30, p = .77, d = .05. Furthermore, on-task reports were more common in the Fixed 2 condition than in the Fixed 8 condition, t(79) = 2.36, p = .021, d = .52. Conversely, mind-wandering reports were more common in the Fixed 8 condition than in the Fixed 2 condition, t(79) = 2.33, p = .022, d = .52. Next, we examined differences in the intentionality of the mind-wandering reports as a proportion of the total number of thought probes (i.e., dividing the total number of each type of mind-wandering report by the total number of probes) and condition. There was a main effect of intentionality, F(1, 79) = 38.15, MSE = .01, p < .001, ηp2 = .33, with unintentional mind wandering (M = .14, SD = .13) occurring more frequently than intentional mind wandering (M = .04, SD = .08). As shown in Fig. 6b, there was a main effect of condition, F(1, 79) = 5.45, MSE = .012, p = .022, ηp2 = .065, with more overall mind wandering in the Fixed 8 condition compared with the Fixed 2 condition. The interaction between intentionality and condition did not quite reach conventional levels of significance, F(1, 79) = 3.19, MSE = .01, p = .078, ηp2 = .039. Note that these results do not conceptually replicate Seli et al. (2016, b), who found that intentional mind wandering increased while performing an easy task compared with a hard task. In the current study, there were no differences in intentional mind-wandering rates between the Fixed 2 and Fixed 8 conditions, t(79) = −.67, p = .503, d = −.15. Unintentional mind-wandering rates, however, did change as a function of condition, t(79) = −2.42, p = .018, d = −.54, with more unintentional mind wandering in the Fixed 8 condition than in the Fixed 2 condition. Examining overall reaction times suggested that responses were faster in the Fixed 2 condition (M = 286 ms, SD = 42) than in the Fixed 8 condition (M = 342 ms, SD = 54), t(79) = −5.24, p < .001, d = −1.17. As shown in Fig. 6c, on-task reports were associated with faster reaction times than overall mind-wandering reports, F(1, 53) = 37.44, MSE = 1579, p < .001, ηp2 = .41, and this did not change as a function of condition, F(1, 53) = .917, MSE = 1579.07, p = .343, ηp2 = .02. Next, we attempted to examine differences between the different mind-wandering reports, but, as noted previously, there were very few reports of intentional mind wandering, and very few participants reported both types of mind wandering. Specifically, 64.2% of all participants did not report any intentional mind wandering, and only 28.4% of all participants reported both intentional and unintentional mind wandering. Thus, there were not enough participants to properly analyze the data. Examining differences in tonic pupil diameter for on-task and mind-wandering reports as a function of condition suggested no effect of attentional state, F(1, 51) = .99, MSE = .34, p = .33, ηp2 = .02, and no effect of condition, F(1, 51) = 1.73, MSE = .25, p = .19, ηp2 = .03. The interaction between the two factors was, however, significant, F(1, 51) = 4.20, MSE = .34, p = .046, ηp2 = .08. As shown in Fig. 7a, on-task reports were associated with larger pretrial pupil diameter than with mind wandering in the Fixed 2 condition, t(24) = 2.57, p = .017, d = .52, but on-task and mind-wandering reports were associated with similar pretrial pupil diameters in the Fixed 8 condition, t(27) = −.67, p = .51, d = −.13. Examining TEPRs as a function of attentional state and condition suggested that on-task reports were associated with larger TEPRs than were mind wandering reports, F(1, 46) = 4.71, MSE = .011, p = .035, ηp2 = .09 (see Figs. 7b–c). There was no effect of condition, F(1, 46) = 2.61, MSE = .014, p = .11, ηp2 = .05, and no interaction between the two factors, F(1, 46) = .12, MSE = .011, p = .73, ηp2 = .003. Similar to the reaction-time results, there were not enough participants to examine differences between the different mind-wandering reports for pupil diameter. The results from Experiment 4 suggested that in the fast-paced condition promoting focused attention and goal maintenance, performance was better and participants reported being more on task than in the slow-paced condition that allowed participants to potentially take time-outs and promoted more mind wandering. Although it should be noted that the change in mind-wandering reports as function of task pacing only occurred for unintentional mind wandering and not intentional mind wandering. Thus, in the current data it is unlikely that this form of mind wandering was intentional. In terms of tonic pupil diameter, the fast-paced condition suggested that mind wandering was associated with a lowered arousal state compared with on-task reports. In the slow-paced task, however, there was no difference in tonic pupil diameter between on-task and mind-wandering reports, suggesting similar levels of arousal potentially due to more active mind wandering occurring in the slow-paced task. In terms of TEPRs, mind wandering was associated with smaller TEPRs than on-task reports, and this did not differ as a function of task pacing. These results are broadly consistent with the prior experiments (and prior research) suggesting that in some situations, mind wandering is associated with lowered arousal and lowered alertness compared with on-task focus states. In other situations, mind wandering is associated with increased arousal levels that are similar to on-task reports, even though mind wandering is still associated with worse behavioral performance and smaller TEPRs (indicative of perceptual decoupling). Given the similarities in results across experiments, we further examined the data via combined cross-experimental analyses. This was done in order to better test the predictions of interest with a larger combined sample with more power. Specifically, we combined data (reaction time, pretrial baseline, and TEPRs) from those conditions that theoretically promote external attention and on-task behaviors (the variable condition from Experiment 3 and the Fixed 2 condition from Experiment 4) and compared that to combined data from conditions that theoretically promoted more internal attention and active mind wandering (Experiment 2, the fixed condition from Experiment 3, and the Fixed 8 condition from Experiment 4). Note that we did not include Experiment 1 data because that version of the psychomotor vigilance task was quite different than what was used in the other experiments. Specifically, the psychomotor vigilance task used in Experiment 1 was the more standard 10-min version, with roughly 75 trials and 15 thought probes. The psychomotor vigilance task used in the remaining experiments took roughly 30 min to complete, with more trials and more thought probes. Given strong time-on-task effects on both behavior (Dinges & Powell, 1985; Unsworth & Robison, 2016a) and pupillary responses (Unsworth & Robison, 2016a) for this task, and given the large differences in the number of trials and thought probes, it did not seem appropriate to include Experiment 1 data. Although we note that including Experiment 1 data led to qualitatively similar results to those reported. Similar to the above analyses, only participants who had both on-task and mind-wandering reports were included in the analyses. Examining on-task versus mind-wandering reports as a function of orientation of attention suggested no difference in the frequency of on-task and mind-wandering reports, F(1, 178) = 2.50, MSE = .06, p = .12, ηp2 = .01, and no effect of orientation of attention, F(1, 178) = .24, MSE = .03, p = .63, ηp2 = .001. Importantly, there was an interaction between these factors, F(1, 178) = 4.23, MSE = .06, p = .041, ηp2 = .02. As shown in Fig. 8a, on-task reports were more frequent than mind-wandering reports in those situations where an external focus of attention was promoted, t(73) = 2.25, p = .028, d = .26. However, there was no difference between on-task and mind-wandering reports in situations thought to promote internal attention devoted to active mind wandering, t(105) = −.39, p = .70, d = −.04. Examining only on-task reports suggested a numerical decrease in on-task reports in internally oriented situations compared with externally oriented situations, although the effect was not quite significant, t(178) = 1.74, p = .083, d = .26. Examining only mind-wandering reports suggested a numerical increase in mind-wandering reports in internally oriented situations compared with externally oriented situations, although the effect was not quite significant, t(178) = 1.66, p = .098, d = .25. As shown in Fig. 8b, examining reaction times suggested that on-task reports were associated with faster reaction times than were mind-wandering reports, F(1, 123) = 61.51, MSE = 4366, p < .001, ηp2 = .33, and situations thought to promote external attention to the task were associated with faster reaction times than were situations thought to promote internal attention directed toward active mind wandering, F(1, 123) = 7.18, MSE = 7128, p = .008, ηp2 = .06. These two factors did not interact, F(1, 123) = 1.12, MSE = 4366, p = .29, ηp2 = .009. Examining differences in tonic pupil diameter for on-task and mind-wandering reports as a function of orientation of attention suggested an effect of attentional state, F(1, 119) = 4.75, MSE = .29, p = .031, ηp2 = .04, in which on-task reports were associated with larger pretrial pupil diameters (M = .11, SD = .42) than were mind-wandering reports (M = −.04, SD = .41). There was no effect of orientation of attention, F(1, 119) = .11, MSE = .24, p = .745, ηp2 = .001. The interaction between the two factors was significant, F(1, 119) = 7.13, MSE = .29, p = .009, ηp2 = .06. As shown in Fig. 9a, on-task reports were associated with larger pretrial pupil diameter than was mind-wandering in situations promoting external attention, t(45) = 3.93, p < .001, d = .58, but on-task and mind-wandering reports were associated with similar pretrial pupil diameters in situations thought to promote internal attention, t(74) = −.36, p = .72, d = −.04. Examining TEPRs as a function of attentional state and condition suggested that on-task reports were associated with larger TEPRs than were mind-wandering reports, F(1, 105) = 14.67, MSE = .007, p < .001, ηp2 = .12 (see Figs. 9b–c). The effect of orientation did not quite reach conventional levels of significance, F(1, 105) = 3.47, MSE = .011, p = .065, ηp2 = .03. The interaction between the two factors was not significant, F(1, 105) = .53, MSE = .007, p = .47, ηp2 = .005. The results from the combined analyses suggest that situations thought to promote more external attention to the task were associated with more on-task reports than with mind-wandering reports and larger tonic pupil diameters for on-task reports compared with mind-wandering reports. That is, attention was primarily focused on the external task leading to greater on-task focus. However, on some trials participants tended to mind wander, leading to momentary lapses of attention. In these situations, mind wandering was primarily associated with lowered arousal levels consistent with nonalert mind wandering. Situations thought to promote internal attention and more mind wandering, however, were associated with similar rates of on task and mind wandering and similar tonic pupil diameters for on-task and mind-wandering reports, suggesting similar arousal levels. In these situations, attention was directed internally, promoting more mind wandering rather than being focused on the external task at hand, leading to less on-task focus. Furthermore, in both situations, mind wandering was associated with worse behavioral performance and smaller TEPRs. Collectively, the combined analyses suggest that in some situations, mind wandering is associated with lowered arousal states and temporary disengagement from the current external task. In other situations, mind wandering is associated with similar arousal states as are on-task reports, indicative of a mind-wandering state where attention is focused more internally. Although the primary focus of the current study was to examine similarities and differences between mind-wandering and on-task behaviors, we also examined potential similarities and differences between mind wandering and mind blanking (Ward & Wegner, 2013). In a prior study (Unsworth & Robison, 2016a), we found that mind wandering and mind blanking (what we called inattention) were associated with similar reaction times, similar tonic pupil diameters, and similar TEPRs. That study used a standard version of the psychomotor vigilance task thought to promote on-task behaviors. Thus, it is not clear whether mind wandering and mind blanking are similar in conditions that promote more internal attention and more active mind wandering. If mind blanking is consistently associated with lowered arousal levels, then we would expect that mind blanking and mind wandering would show similar tonic pupil diameters only in situations promoting external attention. In situations promoting internal attention and more active mind wandering, however, mind wandering should be associated with larger tonic pupil diameters than would mind blanking. However, both should demonstrate similar TEPRs to the extent that both are associated with perceptual decoupling. Thus, we examined similarities and differences between mind-wandering and mind-blanking responses in the combined data. Similar to the above analyses, only participants who had both mind-wandering and mind-blanking reports were included in the analyses. Thus, some of the mind-wandering analyses will not directly match those reported above, given that some participants who reported being on task never reported mind blanking, and some participants who reported mind blanking never reported being on task. Examining mind-wandering versus mind-blanking reports as a function of orientation of attention suggested that mind-wandering (M = .21, SD = .18) reports were more frequent than mind-blanking (M = .14, SD = .19) reports were, F(1, 178) = 9.67, MSE = .04, p = .002, ηp2 = .05. There was an effect of orientation of attention, F(1, 178) = 4.03, MSE = .03, p = .046, ηp2 = .02, suggesting that there was more mind wandering and mind blanking in situations promoting internal attention compared with situations promoting external attention. The interaction between the two factors was not significant, F(1, 178) = .13, MSE = .04, p = .72, ηp2 = .001. Mind-wandering reports were associated with faster (M = 366 ms, SD = 68) reaction times than were mind-blanking reports (M = 385 ms, SD = 87), F(1, 99) = 7.17, MSE = 3002, p = .009, ηp2 = .07. There was no effect of orientation of attention, F(1, 99) = .30, MSE = 9222, p = .59, ηp2 = .003, and no interaction, F(1, 99) = 2.25, MSE = 3002, p = .14, ηp2 = .02. Examining differences in tonic pupil diameter for mind-wandering and mind-blanking reports as a function of orientation of attention suggested an effect of attentional state, F(1, 91) = 5.88, MSE = .36, p = .017, ηp2 = .06, in which mind-wandering reports were associated with larger pretrial pupil diameters (M = .11, SD = .53) than were mind-blanking reports (M = −.14, SD = .66). There was no effect of orientation of attention, F(1, 91) = .03, MSE = .37, p = .855, ηp2 = .000. The interaction between the two factors approached conventional levels of significance, F(1, 91) = 3.87, MSE = .36, p = .052, ηp2 = .04. As shown in Fig. 10a, mind-wandering and mind-blanking reports were associated with similar pretrial pupil diameters in situations thought to promote external attention, t(35) = .40, p = .693, d = .07, but mind-wandering reports were associated with larger pretrial pupil diameter than were mind blanking in situations promoting internal attention, t(56) = 3.11, p = .003, d = .41. Examining TEPRs as a function of attentional state and condition suggested no difference between mind wandering and mind blanking (see Figs. 10b–0c), F(1, 82) = .462, MSE = .007, p = .499, ηp2 = .006. No effect of orientation, F(1, 82) = .03, MSE = .007, p = .853, ηp2 = .000, and no interaction between the two factors, F(1, 82) = .07, MSE = .007, p = .79, ηp2 = .001. Examining similarities and differences between mind wandering and mind blanking suggested that mind wandering was more frequent than was mind blanking, and mind blanking was associated with slower reaction times than was mind wandering. In terms of pupil diameter, mind wandering and mind blanking demonstrated similar tonic pupil diameters in situations thought to promote external attention to the task. However, in situations thought to promote internal attention and more active mind wandering, mind wandering reports were associated with greater tonic pupil diameter than were mind blanking. In all situations, mind-wandering and mind-blanking reports were associated with similar TEPRs. These results suggest that in some situations, mind wandering and mind blanking are similarly associated with lowered arousal levels. In other situations, however, mind wandering is associated with increased arousal levels compared with mind blanking. In four experiments, we examined the relation between arousal and different mind-wandering states using pupillometry. In Experiment 1, we found that tonic (pretrial baseline) pupil diameter was smaller when participants reported mind wandering compared with being on task in both the psychomotor vigilance and Stroop tasks. In Experiment 2, when participants were told they would have to give a speech following the psychomotor vigilance task, there were no differences in tonic pupil diameter for on-task and mind-wandering reports. In Experiment 3, tonic pupil diameter was larger for on-task reports than it was for mind wandering in the standard version of the psychomotor vigilance task with variable wait times. However, with a fixed 5-s wait time, there were no differences in tonic pupil diameter between on-task and mind-wandering reports. Although, keep in mind that these results are ambiguous given that the overall interaction was not significant. In Experiment 4, when the wait time was fixed at 2 s, on-task reports were associated with larger tonic pupil diameters than were mind-wandering reports. However, when wait time was fixed at 8 s, there were no differences in tonic pupil diameter for on-task and mind-wandering reports. Thus, tonic pupil diameter varied as a function of experimental conditions. In each experiment, however, mind-wandering reports were associated with poorer behavioral performance and smaller TEPRs. Combining data across Experiments 2–4 suggested that situations promoting external attention and on-task behaviors resulted in on-task reports being associated with larger tonic pupil diameters than were mind-wandering reports. In situations promoting internal attention and mind wandering, there were no differences between on-task and mind-wandering reports in terms of tonic pupil diameter. But in all conditions, mind wandering was associated with worse behavioral performance and smaller TEPRs than were on-task reports. These results are broadly consistent with the notion that different mind-wandering states are associated with different arousal levels and the extent to which an external or internal orientation of attention is promoted. That is, as shown in Fig. 1, and based on prior theorizing (Lenartowicz et al., 2013; Mittner et al., 2016), it was hypothesized that there are distinct mind-wandering states associated with different levels of arousal and LC-NE activity. Specifically, in comparison with on-task states, mind wandering can be associated with low arousal levels (consistent with nonalertness), optimal arousal levels (consistent with active mind wandering), or high arousal levels (consistent with exploratory mind wandering). The results of the current study suggest that in many attention demanding situations, when attention is directed to the current external task, mind wandering is due to temporary task disengagements associated with lowered arousal levels and nonalertness linked to the lower portion of the LC-NE curve (see Fig. 1). In these situations, on-task and mind-wandering states can be distinguished by differences in tonic pupil diameter, TEPRs, and behavior. Other times, mind wandering is associated with more optimal arousal levels and an internal focus of attention, suggesting that participants are disengaged from the current task, with attention focused on internal thoughts and concerns linked with the middle portion of the LC-NE curve (see Fig. 1). In these situations, on-task and mind-wandering states can be distinguished by differences in TEPRs and behavior, but because arousal levels are similar for on-task and mind-wandering states, tonic pupil diameter should be similar. This suggests that internal/external orientation of attention affects not only the features of mind-wandering episodes but also the extent to which on-task focus is heightened or lessened. Throughout we have labeled this mind-wandering state as active mind wandering, based on prior theorizing (i.e., Mittner et al., 2016). However, it should be noted that in the current data there was no real evidence to suggest that the contents and features of this mind-wandering state are necessarily different than the mind-wandering state associated with lowered arousal and alertness. Specifically, there was no evidence in the current study that these states differed in terms of temporal focus of mind wandering (Experiment 3) or intentionality of mind wandering (Experiment 4). Thus, although the current data demonstrate that different mind-wandering states are associated with different arousal (and alertness) levels, it is not clear that these states are related to qualitatively different types of mind wandering in terms of the content and features of the mind-wandering episode. Future research is needed to better examine whether mind-wandering states associated with different arousal levels differ in the contents and features of the mind-wandering episode, and the extent to which mind wandering associated with intermediate arousal levels is actually reflecting “active” mind wandering. Finally, it was hypothesized that in some situations, mind wandering is associated with heightened arousal levels and exploratory mind wandering linked with the upper part of the LC-NE curve (i.e., Mittner et al., 2016). In these situations, it would be expected that on-task and mind-wandering states could be distinguished based on tonic pupil diameter (larger for mind-wandering than for on-task reports), TEPRs, and behavior. However, there was no evidence in the current study for exploratory mind wandering associated with heightened arousal. This could be due to the tasks used as well the possibility that the various manipulations were not suited for shifting participants into a more exploratory state. Recent prior research has suggested that lapses of attention are associated with both smaller and larger tonic pupil diameters, suggesting that at least some lapses are due to heightened arousal linked with an exploratory state (Konishi et al., 2017; Unsworth & Robison, 2016a; van den Brink et al., 2016). Future research is needed to better examine possible instances of exploratory mind-wandering states. In Experiments 3 and 4, we additionally attempted to examine if types of mind wandering associated with temporal focus (Experiment 3) and intentionality of mind wandering (Experiment 4) are associated with different arousal levels. Unfortunately, in both experiments, there was not enough data allowing for a proper analysis given that many participants did not report past-oriented mind wandering or intentional mind wandering. Future research should examine how temporal focus and intentionality of mind wandering are associated with different mind-wandering states and arousal via different tasks and manipulations that better promote different temporal focuses (reminiscing about the past vs. planning for the future), and allow for more deliberate and intentional mind wandering (e.g., by making the tasks very easy and monotonous). More data are needed to examine whether these and other aspects of mind wandering (emotional valence, self-relevance, etc.) are associated with different arousal states in a meaningful way. We also examined potential similarities and differences between mind-wandering and mind-blanking states. In the combined analyses, we found that in situations thought to promote external attention and on-task behaviors, mind wandering and mind blanking demonstrated similar tonic pupil diameters and TEPRs. However, in situations thought to promote internal attention and active mind wandering, mind-wandering reports were associated with larger tonic pupil diameters than were mind-blanking reports, although they demonstrated similar TEPRs. These results suggest that in some situations mind wandering and mind blanking are very similar and are associated with lowered arousal levels and nonalertness linked with the bottom portion of the LC-NE curve. In other situations, however, mind wandering and mind blanking can be differentiated by arousal levels such that mind blanking is still associated with lowered arousal, but mind wandering is associated with heightened arousal. This finding is similar to recent research by Stawarczyk and D’Argembeau (2016), who found that mind blanking was associated with higher levels of drowsiness than was mind wandering, suggesting that mind blanking and mind wandering are distinguishable. Thus, in many attention-demanding situations, mind wandering and mind blanking are likely similar. However, mind wandering is a more heterogeneous construct in which there are different mind-wandering states as a function of arousal levels. More research is needed to examine similarities and differences between mind blanking and mind wandering. The current results have important implications for tracking mind wandering and lapses of attention via pupillometry. In particular, there is likely not a one-to-one mapping between mind wandering (and other lapses) to pupil diameter (tonic or TEPRs). Rather, depending on arousal levels, different mind-wandering states and different flavors of lapses of attention (mind wandering, mind blanking, external distraction; Unsworth & Robison, 2016a) will be associated with different tonic pupil diameters (in relation to on-task states). In general, smaller TEPRs seem to be associated with lapses of attention, but again it is possible to have lowered TEPRs that are not due to a lapse of attention per se (e.g., low effort/motivation). Thus, although pupillometry provides a potential means of tracking lapses of attention online, it is important to note that currently no single measure is fully predicative of whether a person is experiencing a lapse or not. Furthermore, the current results suggest that it is important to examine both tonic pupil diameter and TEPRs. Some prior research has suggested that baseline (tonic) pupil diameter and TEPRs are anticorrelated (Gilzenrat et al., 2010), thus it is acceptable to only examine TEPRs (Eldar et al., 2013; Eldar, Niv, & Cohen, 2016). However, the current results demonstrated that in some situations, a small baseline pupil diameter is associated with a small TEPR (nonalert mind wandering), and a large baseline is associated with a large TEPR (on-task states). In other situations, there was no difference in baseline pupil diameter, even though there were differences in TEPRs (on-task states and active mind wandering). Furthermore, at an individual differences levelUnsworth & Robison, (2017) found that baseline pupil diameter and TEPRs were positively correlated in both the psychomotor vigilance (r = .20) and the Stroop (r = .14) tasks. Examining this same data (from Experiment 1) within participants suggests a near-zero correlation between baseline and TEPR in the psychomotor vigilance task (r = .02), but a negative correlation in the Stroop task (r = −.41). Thus, it is unlikely the case that baseline pupil diameter and TEPRs are necessarily strongly anticorrelated, and one can be substituted for the other. Rather, there is a complex relation between the two measures depending on factors such as arousal level and orientation of attention (internal vs. external). A combined approach of examining various pupillary measures (tonic pupil diameter, TEPRs, fluctuations in pupillary responses), behavioral measures, and subjective reports seems fruitful for better understanding the nature of lapses of attention and for tracking various lapses of attention. Overall, the current results demonstrated that pupillary responses differentiated different mind-wandering states associated with varying arousal levels and the extent to which attention was focused externally or internally. In particular, it was demonstrated that in situations that promote external attention and on-task focus, mind-wandering is associated with lowered arousal and alertness levels (non-alert mind wandering). In other situations that promote an internal focus of attention in support of more mind wandering, mind wandering was associated with more optimal levels of arousal and alertness, but less on-task focus. These results provide important evidence for the notion that there are distinct mind-wandering states that vary as a function of arousal levels and the extent to which the current situation promotes an internal or external focus of attention. In sum, the current results provide evidence for the heterogeneous nature of mind wandering, suggesting that different forms of mind wandering are associated with different arousal states and that a combination of behavioral and pupillary measures can be used to track these various states. Future research is needed to better delineate different types of mind wandering (and lapses of attention more broadly) and their association with various arousal states. We thank Mattias Mittner and two anonymous reviewers for helpful comments on a previous version of the article. Data are available on the Open Science Framework. This research was supported by Office of Naval Research Grant N00014-15-1-2790. Note that across all experiments and conditions, there were no differences in the amount of missing pupil data for trials associated with on-task versus mind-wandering reports, all ts < 1.43, all ps > .17. Thus, any pupillary differences are not due to differences in the amount of missing data because of blinks, off-screen fixations, and/or eye-tracker malfunction. Given that prior research has found that reaction times are more variable before mind-wandering reports compared with reaction times for on-task reports, we also examined the coefficient of variation for the five trials prior to each type of report for each experiment. In Experiment 1, there was no difference in coefficient of variation for on-task and mind-wandering reports in either the psychomotor vigilance task, t(95) = −.79, p = .43, or the Stroop task, t(50) = .28, p = .78. In Experiment 2, reaction times were more variable prior to mind-wandering reports compared with on-task reports, t(22) = −3.33, p = .003. In Experiment 3, there was no difference in coefficient of variation for on-task and mind-wandering reports, t(42) = −.81, p = .42. In Experiment 4, reaction times were more variable prior to mind-wandering reports compared with on-task reports, t(52) = −2.10, p = .041. Across experiments, there was inconsistent evidence for the notion that reaction times are more variable prior to mind-wandering reports than to on-task reports. However, in each experiment, the coefficient of variation was numerically larger for mind-wandering reports compared with on-task reports. Therefore, examining the data in the combined analysis suggested that reaction times were more variable prior to mind-wandering reports compared with on-task reports, F(1, 117) = 8.48, MSE = .008, p = .004, ηp2 = .07, and this did not interact with the orientation of attention, F < 1, p > .32. Thus, somewhat consistent with prior research, reaction times tended to be more variable prior to mind-wandering reports than to on-task reports. We thank Matthias Mittner for suggesting these analyses.